1. Renuka of Pinch Of Salt substituted eggs with corn flour and used pistas and almonds for the crunch. Aren’t they lovely? 3. Jayanthi of Sizzling Veggies has done a great job of using silken tofu and light cream instead of eggs. She has also used almonds and raisins for the crunch. They look awesome. 4. 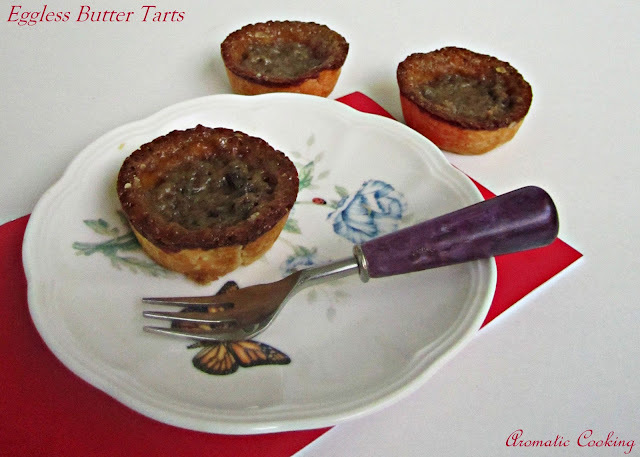 Hema of Aromatic Cooking has tried out these tarts with flax meal and light cream and raisins. She describes this as utterly butterly delicious. They surely look delicious..
5. Rasi of Vegetarian Food And Me has used silken tofu instead of eggs and walnuts and raisins for the cruch. I love to take a bite into it, Rasi! 6. Priya of Culinary Chronicles has used peanut butter, heavy cream and condensed milk for the filling and has decorated it with chocolate chips. A very rich and creamy tart! 7. 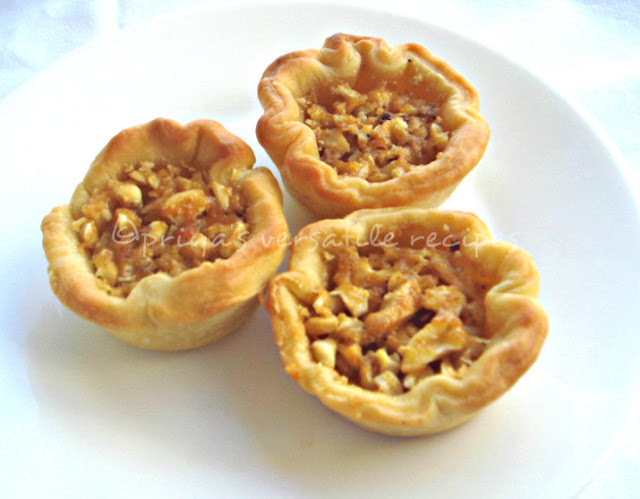 Nupur of UK Rasoi tried the tarts with a filling of bread and corn starch mixture instead of eggs. She has also tried out two versions of the tart. Curious about the methods? Please take a look at her post and you will know. The tarts look fabulous, Nupur. 8. Jayasri Ravi of Samayalarai has substituted eggs with potato starch and condensed milk and has made a healthy crust using whole meal. She has also used pecans, hazelnuts and aisins for the crunch. The tart looks adorable, isn’t it? 9. I used bread slices and milk instead of eggs and the filling was so soft and tasty. I also used walnuts for the crunch. Some of the members have tried blind baking the pastry base first, then filled it and baked it again which resulted in crispier and flakier pastry. Others baked it once along with the filling. The base baked once tend to be softer in the middle and flakier outside, but the pastry baked twice tends to stay crispy and flaky all over. So try it according to your taste. The list of substitutes go on and on. There are so many possibilities of getting these yummy tarts right and here are 9 possibilities which succeeded. 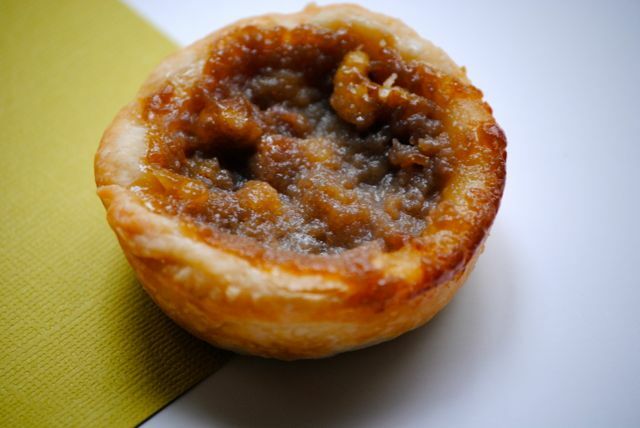 Please take a look at all the recipes and try your version of Butter Tarts at home. Nice roundup, all the egg substitutes have worked out great..
Mindblowing creations, everything looks stunning and beautifully done. Can I ask you why eggless? Just curious. I have seen many eggless recipes but never knew the reason why. If you don’t mind could you answer that question for me? Thank you so much. I am just a regular baker. I use everything. ..but I am always open minded about new baking techniques. There are so many reasons we avoid eggs in cooking Bea Long. some may have religious reasons whereas some may have health issues. That is why we try to substitute eggs in recipes..